Four years ago the Mets were a franchise in transition. 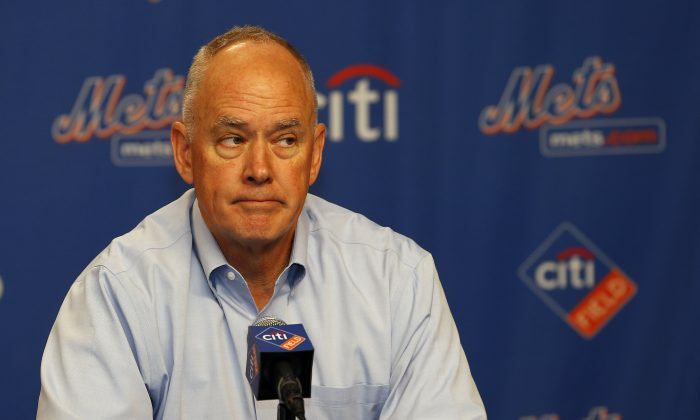 Sandy Alderson was in his first year as general manager and was busy trying to rebuild the team with young players while jettisoning any older, overpaid veterans—without losing too many games in the process. Fortunately for him, his predecessor, Omar Minaya, hadn’t set the bar too high. The Mets had made the playoffs just once during Minaya’s reign (2004–2010) and were coming off consecutive losing seasons, so it wasn’t like there was a dropoff in performance when they went 77–85 that first year (2011). Yet Minaya did leave behind some talent to work with—namely David Wright, Carlos Beltrán, R.A. Dickey, and the soon-to-be free agent José Reyes. Among his many moves his first year in New York, Alderson wisely dealt Beltrán to the Giants for minor league pitcher Zack Wheeler. He would eventually move Dickey the following offseason for then-prospects Noah Syndergaard and Travis D’Arnaud—right after Dickey won the Cy Young award—before signing David Wright to a long-term extension. But Reyes was the toughest choice. While trading Beltrán and Dickey was excusable to the fanbase due to their ages (both in their mid-30s), the speedy Reyes was just 28 and would win the batting title that year, while swiping 39 bases and garnering a league-high 16 triples. He was in his prime and was the premier leadoff hitter in the game and Mets fans loved him. 5 of Baseball’s Silliest Unwritten Rules. Written Down Here. As popular and skilled as the four-time All-Star Reyes was though, his reliance on speed as well as his history of hamstring injuries made him a highly risky long-term signing. Plus, his defense—average at the time—didn’t figure to get better with age. So when the Marlins, of all teams, came along that offseason with a back-loaded six-year, $106 million contract that blew away anything the conservative Alderson was ready to commit to, he and the Mets did the unpopular thing and let the popular shortstop walk without an official offer. Instead, the Mets were left with a compensation pick that Alderson used on now-rookie catcher Kevin Plawecki and a lot of unhappy fans. Fast forward four years and the Mets are playoff-bound with a payroll that doesn’t include future commitments of $48 million from 2016 to 2017 for a 32-year-old shortstop with declining skills (he’s hitting .273 this year with 23 steals). Instead they’re built around a nucleus of young players—like Syndergaard, Wheeler, d’Arnaud, and Plawecki—that have taken the NL East by storm. Meanwhile Reyes is on his third team since leaving. Letting him walk was an unpopular move, but it was ultimately the right one. Baseball has a number of unwritten rules—here are the silliest ones. Matt Harvey isn't helping the team much with his innings limit, so why not move him to the bullpen?